i watched it yesterday and it was just then that i developed a certain liking to chad murray. well he still hasn't reached my ryan philippe standards but he did act really sweet to sam (hillary duff) during the holloween homecoming party. and his prince outfit (although not so holloween-ish) fits him well(or maybe it will look better on ryan philippe, how i wish i could just steal him from reese witherspoon). i realized if you want to win a costume party, you'll have to wear a wedding gown. nevermind the spooky theme, just wear a wedding gown and you will win. the movie really scared the hell out of me. 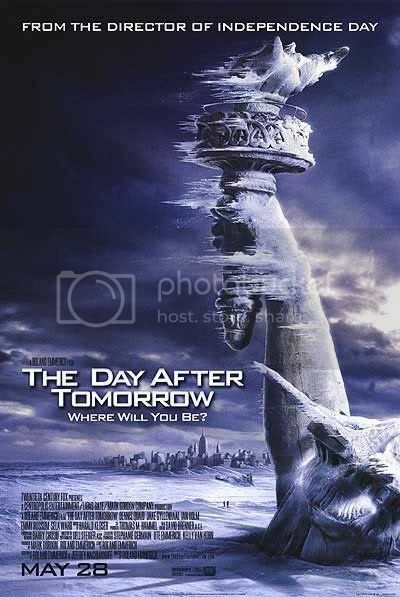 the thing about the abrupt shifting of climate is really OF REACH especially now that the effects of Global Warming are starting to flood the whole world and will eventaully reiterate the ice age. i think we should run the "STOP GLOBAL WARMING" campaign more seriously just like how we cooperated with "MAKE POVERTY HISTORY" campaign well. if you watch the movie carefully then you would think that it's already raining outside and blocks of hale is budging your roof open. what i like about it is its ability to make things sound so fact-based that you would really FEEL that the world is about to enter a new age. sam: i told him i did it mentally. jack: oh, he can't flunk you for being smarter than he is. by the way... i have a new (unusual) look. haha... ask me who did it and how it was done!!!! i cut my hair using dad's shaver.